Welcome back to Executive Function series on my blog. Today my post is about working memory and possible ways to help your children with deficits in working memory through activities that either strengthen working memory or help compensate for its weakness. How Does Weak Working Memory Look Like? Does your child have problems following verbal directions? Does she have problems in writing – missing letters, misspelled words? Does he have to constantly look at the board trying to copy an assignment on paper? Does she still use her fingers to add two digit numbers in her head? Does he constantly forget things at home or at school? Does she seem to have problems connecting ideas while presenting material orally? All these different behaviors might be symptoms of the same root cause – weak working memory. Interestingly, there are two types of working memory – auditory and visual-spatial. It’s possible for people to have problems with one kind only, but it’s also common for both types of working memory to be weak at the same time. Does Working Memory Equal intelligence? Kids with working memory might appear to be less intelligent than their peers, but it’s possible to have a high IQ and still struggle with working memory issues. Classic “absent-minded professor” stereotype comes to mind here. At the same time, working memory strength seems to be a better predictor of academic success than IQ, and a major contributing component of general intelligence. Since working memory appears to be so important and young brains are so plastic, it stands to reason that children will benefit from activities designed to strengthen working memory function. Can You Train Working Memory? There are many apps that claim to train your brain, but the research on brain training is still out with majority of studies finding that memory gains achieved through these brain training methods do not transfer to practical tasks of daily life. I think good old Memory game is better for improving working memory than apps, especially for young children. For older children, card games are great for working memory, especially those games that require some sort of card counting or remembering your hand. My daughter, for example, really enjoys the game she learned to play this summer – card golf game. Word games are also great for improving working memory – What Do We Do All Day has a great list of word thinking games for kids that require them to remember lists of objects or name items from the same category. We play these games in the car or while waiting in the restaurant. All is not lost for kids (and adults) that struggle with working memory challenges. I highly recommend Smart but Scattered book that offers multiple strategies for dealing with them. Strategies might differ depending on your child’s learning style. Visual learners will certainly appreciate lists and visual reminders. Mind maps might work well for them while connecting new information to existing anchors. You can ask auditory learners to repeat information back, perhaps in a playful form of a rap song or an opera singing. Older kids might use alerts on their gadgets as reminders in specific context. For example, a vibrating alert in the end of the school day might prompt them to check whether they are bringing all their belongings and necessary papers back home. Kinetic learners might benefit from being allowed to move while doing mental math, but, sadly, it’s more likely to happen at home than in school. You can also check this excellent post with ideas of improving working memory. 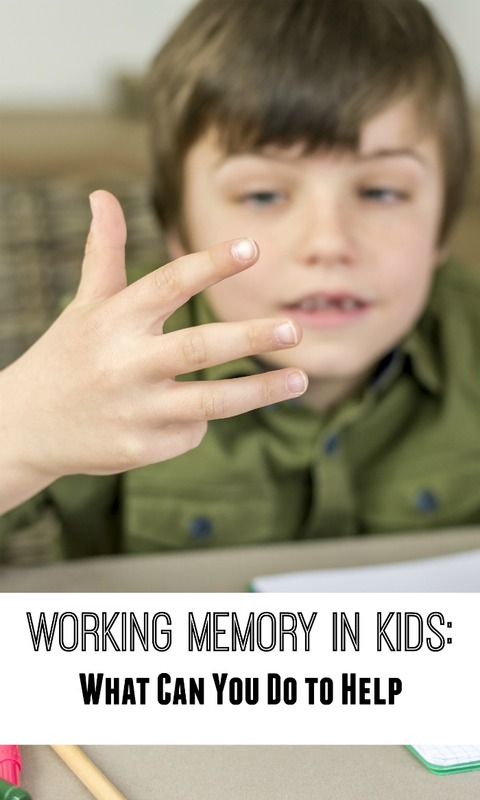 Do you think you or your child struggle with working memory challenges? How do you compensate for them? I carry a small notebook everywhere! Thanks for the reminder on Smart but Scattered, I should read that one for Princess.